In an era when the heart of Tustin was the intersection of Main and D, folks flocked to town to get supplies and swap stories. Some of these stories featured Tustin notables like C.E. Utt, who tried his hand at every local crop; Sam Tustin, whose Buick touring car became the town fire truck; Big John Stanton, who formed the one-man police department; and Dr. William B. Wall, who found inspiration for his orange crate label in a rooster painting from Grover Cleveland. Drawing from her Tustin News column "Remember When," third-generation Tustin resident Juanita Lovret recalls the small-town ranching roots of Tustin as It Once Was. Juanita Lovret is a third-generation resident of Tustin, with her grandparents settling there in 1885. After graduating from the University of Southern California, she pursued a career that combined writing, editing and teaching, with local history as her avocation. She is a longtime member of the Tustin Area Historical Society and has served on the board as publicity chairman and president. 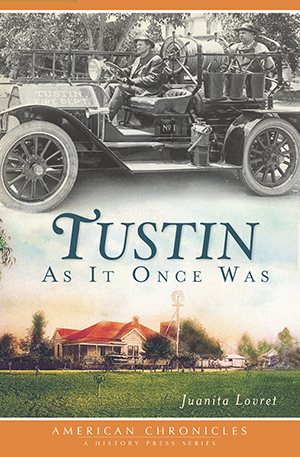 She's written a column based on Tustin history, “Remember When,” for the Tustin News since 1997. She was named Tustin Woman of the Year in 1996, received the Tustin Preservation Conservancy's the Spirit of Old Town Award in 2009 and the Elks Distinguished Citizenship Award in 2010.